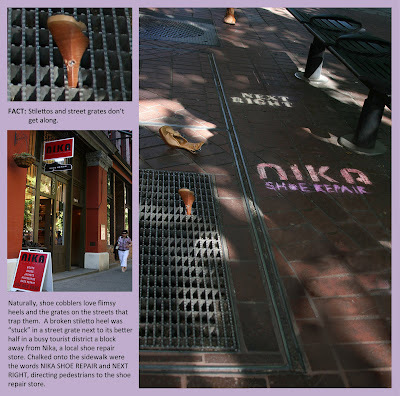 directdaily: Nika Shoe Repair "Heel"
Naturally, shoe cobblers love flimsy heels and the grates on the streets hat trap them. A broken stiletto heel was "stuck" in a street grate next to its better half in a busy tourist district a block away from Nika, a local shoe repait store. Chalked onto the sidewalk were the words NIKA SHOE REPAIR and NEXT RIGHT, directing pedestrians to the shoe repair store.